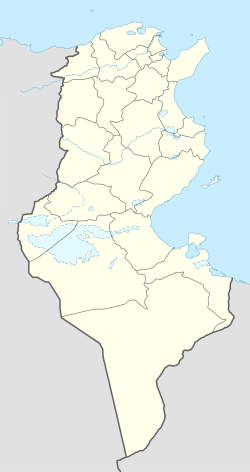 El Djem or El Jem (Tunisian Arabic: الجمّ, il-Jām) is a town in Mahdia Governorate, Tunisia. Its population was 21,576 during the 2014 census. It is home to some of the most impressive Roman remains in Africa, particularly the world-famous "Amphitheater of El Jem". The Roman city of Thysdrus was built, like almost all Roman settlements in ancient Tunisia, on former Punic settlements. In a less arid climate than today's, Thysdrus prospered as an important center of olive oil production and export. It was the seat of a Christian bishopric, which is included in the Catholic Church's list of titular sees. By the early 3rd century, when the amphitheater was built, Thysdrus rivaled Hadrumetum (modern Sousse) as the second city of Roman North Africa after Carthage. However, following the abortive revolt that began there in AD 238 and Gordian's suicide in his villa near Carthage, Roman troops loyal to the emperor Maximinus Thrax sacked the city. The town is shown on the 4th-century Peutinger Map. View of the first two amphitheaters. El Djem is famous for its amphitheater or colosseum. It was capable of seating 35,000 spectators. Only the Colosseum in Rome (seating about 50,000 spectators) and the ruined theater of Capua were larger. The amphitheater at El Djem was built by the Romans under proconsul Gordian, who was acclaimed emperor at Thysdrus around 238 and was mainly used for gladiator shows and small-scale chariot races. Many tourists come here to see what it was like to be inside what was once a place where lions and people met their fate. Much of it is crumbled but the essence of it still remains. It is also possible that construction of the amphitheater was never finished. Until the 17th century, it remained more or less whole. From then on its stones were used for building the nearby village of El Djem and transported to the Great Mosque in Kairouan. At a tense moment during struggles with the Ottomans, the Turks used cannons to flush rebels out of the amphitheater. The ruins of the amphitheater were declared a World Heritage Site in 1979. It hosts the annual El Djem International Symphony Festival. Drifting sand is preserving the market city of Thysdrus and the refined suburban villas that once surrounded it. Some floor mosaics have been found and published, one of them featuring the most known iconography of (Dea) Africa, but field archaeology has scarcely been attempted. Recently with aerial photos, a huge racetrack stadium has been discovered. In the world of writing materials, Thysdrus lay in the Empire of Papyrus, which preserves ruins remarkably well if kept as dry as at El Djem. During World War II a major military airfield was located near El Djem, used first by the German Luftwaffe. It was attacked on numerous occasions and later used by the United States Army Air Forces Twelfth Air Force as a transport field. There are few, if any, remains of the airfield today with the land being returned to agricultural uses outside of the city. ^ Gifty, Ako-Adounvo. Studies in the Iconography of Blacks in Roman Art. Ph.D. Thesis awarded by McMaster University. p. 82. Wikimedia Commons has media related to El Jem.